Mescalero, NM – On Friday, May 29, 2015, Chairman Terry Rambler attended the Apache Alliance Meeting which was hosted by the Mescalero Apache Tribe and held at the Inn of the Mountain Gods. This was a very important meeting where Chairman Rambler did a presentation to the group on the Southeast Arizona Land Exchange Act and how the San Carlos Apache Tribe needs the Alliance’s support in repealing the Act. 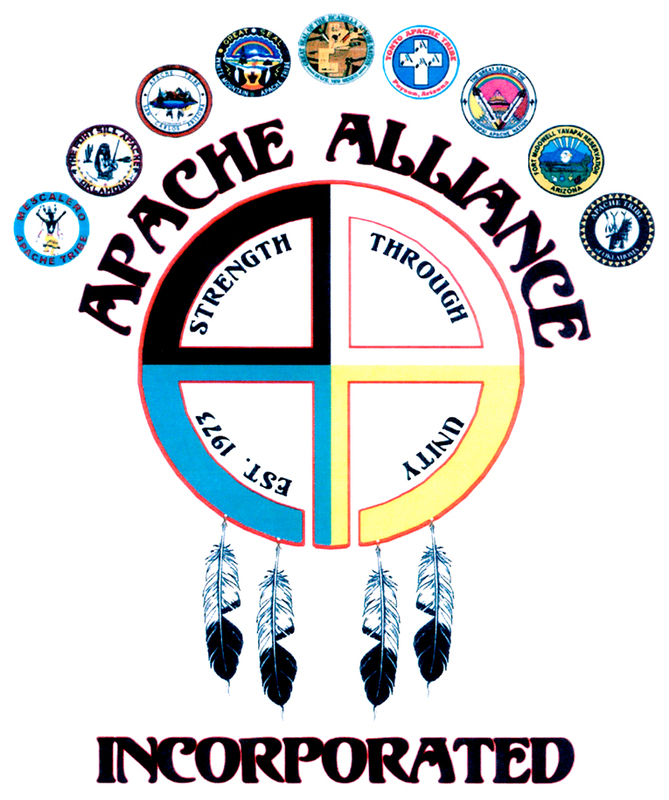 The Apache Alliance is a non-profit organization comprised of nine Apache Tribes from the states of Arizona, New Mexico, and Oklahoma. The Apache Alliance is made up of the following tribes: White Mountain Apache Tribe, San Carlos Apache Tribe, Yavapai-Apache Nation, Ft. Sill Apache Tribe, Jicarilla Apache Tribe, Mescalero Apache Tribe, Apache Tribe of Oklahoma, Tonto Apache Tribe, and Fort McDowell Yavapai Nation. Apache Alliance is a group of sovereign, independent Apache Tribes who recognize the importance and benefit of being united on common causes. The Alliance strives to retain their historic and traditional sovereignty and independence as an Apache Nation; who have the right to determine their own destiny and ways of life. They are organized to provide legislative and public policy resources for Apache Tribes, policymakers, and the public on tribal issues of common concern. They are also established to promote, protect and preserve the general welfare and interests of Apache Tribes by supporting Apache tribal governmental processes. Chairman Rambler gave a powerful slide presentation full of pictures and graphs to give the Alliance a visual of the Oak Flat area and how it will be destroyed when Resolution Copper begins their mining project. Chairman Rambler discussed how block cave mining would have an adverse and devastating impact on the environment, not only in the immediate future, but also for generations to come. “My people will no longer be able to harvest acorn in the area, an important staple of our traditional diet, or medicinal plants and herbs that are essential to ceremonies, curing rites, and rituals”, said Chairman Rambler. These are part of the religious and cultural impacts that this land exchange will negatively impact. “As Tribal Leaders, we have to protect the freedom of religion of our people, regardless of where they go to pray to our Creator God. On our Reservation, we have about 32 Christian churches and those that still believe in the Apache religion. As Chairman, I do not make a distinction of who is right and who is wrong. My job is to protect the rights and freedom of our people to practice their faith and how and where they pray”, stated Chairman Rambler. Chairman Ronnie Lupe of the White Mountain Apache Tribal Council later wrote “One particular agenda item that was brought to the table by Chairman Terry Rambler of the San Carlos Apache Tribe was a draft resolution for the repeal of Section 3003 of the FY15 National Defense Authorization Act. To let it stand as it is endangers all Indian Tribes across Indian country and could affect your Tribe/Nation and it is extremely important that Indian Tribes act to repeal Section 3003.” This statement came from Chairman Lupe’s letter to the member Tribes transmitting the certified Resolution encouraging the Apache Tribes to unite and support each other. After a few more questions from the Alliance members, the Apache Alliance unanimously voted to pass the resolution supporting the San Carlos Apache Tribe to repeal the Land Exchange Act. San Carlos, AZ – On Tuesday May 19, 2015 San Carlos Apache Tribal Chairman Terry Rambler and Vice Chairman Tao Etpison traveled to Ledyard Connecticut to the Mashantucket Pequot Tribal Nation to present at the United Southern and Eastern Tribes, INC (USET) 2015 Semi - Annual Meeting. Today, USET has grown to become an inter-tribal organization with 26 federally recognized Tribal Nation members. While defined as a regional organization, USET has developed into a nationally prominent and respected organization due to its broad policy platform and influence on the most important and critical issues facing all of Indian Country. According to the USET website, “supporting all of its issue specific advocacy is a foundation built upon the goals of promoting and protecting the inherent sovereignty rights of all Tribal Nations, pursuing opportunities that enhance Tribal Nation rebuilding, and working to ensure that the United States upholds its sacred trust responsibilities to Indian Country”. Chairman Rambler thanked the USET Tribal Leadership for their warm welcome and the opportunity to speak about the San Carlos Apache Tribal Council action to repeal the Oak Flat Land Exchange Act. Chairman Rambler gave a brief history of the 10-year opposition and legislative battle between Resolution Copper Company and the devious tactics used to get the bill passed by attaching it to the FY 2015 National Defense Authorization Act. “We have had overwhelming support from Indian Country all across the United States” said Chairman Rambler. Chairman Rambler further explained, “Resolution Copper plans to go a mile deep below the Oak Flat area to clear out an area equivalent to 1,400 Dallas Cowboy stadiums to extract ore. They will start blasting from down below moving upwards and will get close to the surface. They have no plans to fill the huge hole they will create. The temperature a mile deep will be around 169 degrees Fahrenheit. You can get an idea of how hot this is if you turn your oven to this temperature. The sheer weight of the dirt, giant boulders, trees, water, and animals above this huge hole will cause the earth to collapse two miles in diameter, forever altering the perfect environment created by our Creator God. This will negatively impact the water sources, both surface and aquifers, in the immediate and surrounding areas. 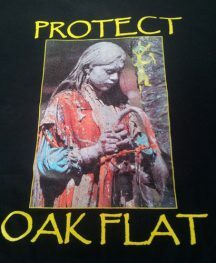 The west end of our Reservation, where our biggest water aquifer sits, is only 15 miles from the Oak Flat area”. A slide show presentation was used to outline the area and plans that Resolution Copper Company has to extract the ore from deep underground. “This type of block cave mining is very destructive to the land and will harm the environment causing lasting negative impacts to the entire region. This project will destroy the natural ecosystems of the area and thereby the religious and cultural integrity of the Oak Flat area which includes Gaan Canyon and Apache Leap. My people will no longer be able to harvest acorns in the area, an important staple of our traditional diet, or medicinal plants and herbs that are essential to ceremonies, curing rites, and rituals of our people”, said Chairman Rambler. “We humbly come here today to seek your support in reaffirming your commitment to the protection of not only Oak Flat but all Native sacred and cultural sites and that USET reach out to your congressional representatives to enact legislation to repeal the Land Exchange Act. I am also asking that individual member Tribes consider passing their own resolutions to make our voice stronger and send a clear message to Congress. Thank you for this opportunity to speak and for all the support USET has given over the past several years on this issue”, said Chairman Rambler. The following day on Wednesday May 20, the USET Tribal Leaders voted on and passed a resolution to support repeal of Section 3003 of the FY15 National Defense Authorization Act, the Southeast Arizona Land Exchange. The Chairmen’s, Chiefs and Presidents of the entire member Tribes were in attendance.